I’m sure you’ve seen them in a lot of designer magazines if not in older homes. 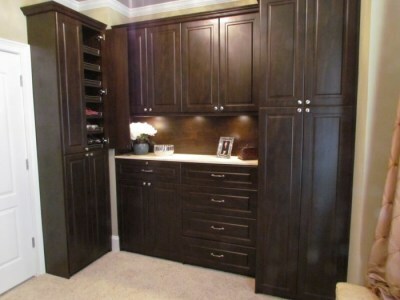 What I’m referring to are stone surfaces such as granite, marble and other stones used in closets. 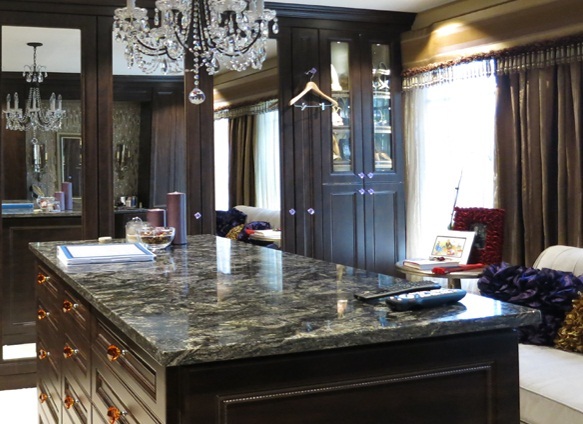 Of course stone has been used for years in bathroom and kitchens for their durability and ease of maintaining cleanliness but why not enhance your closet with the sleek smooth surface of a luxurious granite or sparkling marble? Other possibilities are almost limitless such as limestone, soapstone, glass or even highly-finished concrete. As well, some larger walk-in closets are just not for storing your clothes and other accoutrements, but some are sort of your morning entertainment room. While you’re dressing, you might want to watch the news, get the numbers from the stock market while sipping on your coffee and munching on a bagel. Walk-in’s have for a long time been a great place to get yourself ready for the up-coming day whether the applying make-up or shaving. This is one of the main reasons for having a hard surface in your closet: easy clean-up. Don’t get me wrong, laminates are also very easy to maintain but they can rarely touch the natural beauty that some of the more exotic marbles and granites display.